In what could be a shocking and unexpected move, Manchester United or Chelsea might bid for Joe Hart during the summer transfer window. The England international had been loaned out by rivals Manchester City at the start of the season, and is set to move to another club this summer. The shot stopper has been plying his trade for Torino, as Pep Guardiola decided he wouldn’t fit the system at Manchester City. He was welcomed happily at Torino, but has struggled in the Serie A. The 29-year old has made five errors leading to goals this season – the 2nd most in the league. Yet, his stock hasn’t fallen down much. Hart has been linked to several clubs since moving to Italy, including Liverpool, and the club he is currently at loan for, Torino. The most unexpected link has come up recently though, with Daily Mail reporting that rivals of the Sky Blues from across the city, Manchester United, are looking at the experienced keeper. The Red Devils are worried that David De Gea might move to Real Madrid this summer, and are looking for replacements. However, if Real Madrid end up signing Chelsea’s Thibaut Courtois instead of De Gea, Joe Hart could then head to Stamford Bridge, as Antonio Conte has had positive reports regarding the Englishman from his contacts in Turin. 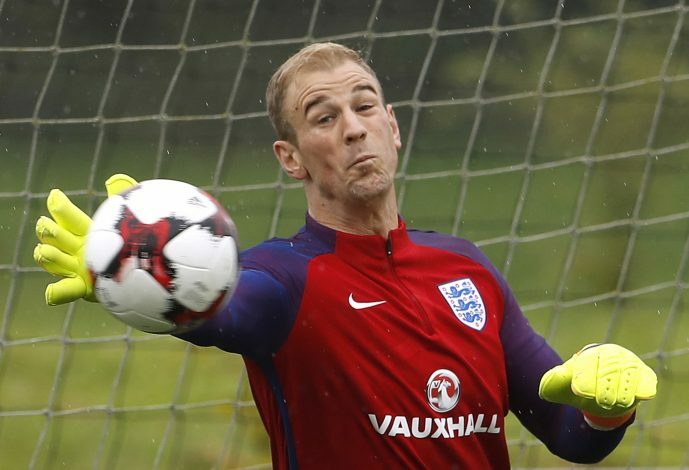 Hart has distinguished himself as a reliable keeper over the past few years, both with City and England. His shot stopping abilities wouldn’t be too far behind De Gea, making him an ideal replacement for the Spaniard. City’s rivalry with United would complicate things, though. United manager Jose Mourinho also has a long-standing rivalry with Guardiola, making this move all the more tougher. The same can be said about Liverpool as a rival club too, even though their managers share less animosity. Hart reportedly has a release clause of €30 million, and Mourinho would have no troubling triggering it. If he does so, City might also want to cash in on it, as Guardiola, who is looking to strengthen his full-back options, could use this money for the same. Pep already has Claudio Bravo and Willy Caballero as his goalkeeping options, meaning the City management might push him to get rid of Hart’s wages. Torino have also repeatedly said that they would love to retain the Englishman’s services, but agree that they wouldn’t be able to afford it. Their coach Sinisa Mihajlovic has even insisted that Hart wants to stay in Turin. “Hart wants to stay at Torino but we are all aware, both him and the club, that we can’t buy him,” La Gazzetta dello Sport reported Mihajlovic as saying.